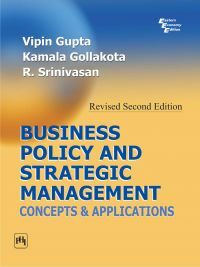 This innovative introduction to business policy and strategic management, covering both the illustrative cases and conceptual foundation, offers authoritative approaches to strategic leadership in emerging markets. Among its many unique features, this comprehensively updated and revised second edition is structured to help students think strategically. Nine different perspectives on organization to capture the rich history of the discipline and enlighten the nature of strategy. The concept of strategic intent to guide action. 9-M model to analyze strategies in functional areas of manpower, materials, methods, money, manufacturing, machine, marketing, motivating, and manipulating. Competitive gaming model to strategize different types of market structures. Internetworking model to develop high-performance Internet ventures. Strategic business model to unfold hidden value into new directions. Value model to explain strategic elements of innovation and technology management. Ethical and international issues in the context of corporate governance. Strategic leadership model relevant to the emerging market ground realities. Strategic control model (both balanced and extended scorecard) to explore the influence of environmental and cultural contexts on effective performance. The text is well supported by more than one thousand sources of international research, India-focused case studies and experiential assignments. This comprehensive text on theory and practice of strategic management is a must read for management students as well as business practitioners and consultants. VIPIN GUPTA (Ph.D. and Post-Doc in Management from Wharton School) is Roslyn Solomon Jaffe Chair Professor of Strategy at Simmons College, Boston. Earlier, he taught at Grand Valley State University (2003-05) and Fordham University (1997-2003). He has offered several training programs and workshops on strategic planning and cross-cultural management to senior executives, administrators, and defense personnel, and on research methods to the doctoral students and faculty in India and the US. |KAMALA GOLLAKOTA (Ph.D.) is Associate Professor at the University of Redlands, California. Prior to this assignment, she taught at the University of South Dakota (1989-2005); earlier, she was an adjunct professor at the University of Maryland. Before entering the academic world, she worked with Crompton Greaves Limited, and thus has experienced the realities of the very corporate world that she now helps the aspiring managers discover.|R. Srinivasan, Associate Professor of Corporate Strategy and Policy, Indian Institute of Management, Bangalore.